Revers A coloured traditional Chinese Dragon head, the words "Year ofthe Dragon" and the symbol for dragon. Pièce d'or colorée Dragon de la Perth Mint 2012 de 1/10 once Purchase your limited mintage 1/10 g oz 2012 Perth Mint Dragon Colourized Gold Coin unique limited mintage gold bullion coin at the best price through our online store! This coin features an artfully designed head of the traditional Chinese dragon. These coins were originally designed solely for the Asian market. 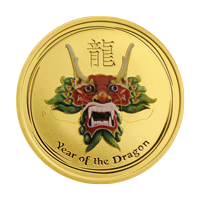 In 2012 the Perth Mint's internationally renowned Australian Lunar gold coins paid homage to the year of the Dragon. As the fifth animal in the 12-year cycle of the Chinese Zodiac, these exquisite quality releases are perfect for people born in "Dragon" years - 1940, 1952, 1964, 1976, 1988, 2000, and in 2012 - who are regarded as independent, confident, enterprising, brave, self-assured and passionate. The reverse features Perth Mint's traditional "P" mintmark, the year and weight are featured on this coin. The Chinese character for "dragon" and the inscription "Year of the Dragon also appear in the design. The coin also features the brilliant colourized visage of a dragon. In addition to appealing to gold coin collectors, these exclusive releases also make excellent gifts for people in any year "ruled" by the Chinese lunar dragon. Get yours today before they are all gone.